If you want to know what your priorities should be for 2019, look at the way your world was at the end of 2018 and at the start of this year. The one trend that seems to be 100 percent reliable coming into 2019 is disruption. The world has been a turbulent place for the last couple of years and looks certain to remain so through 2019. Sure, there is less outright conflict, but there are internal stresses and strains within countries and regions, and major geopolitical threats too. These translate into the everyday concerns of our employers, clients and sponsoring organizations. 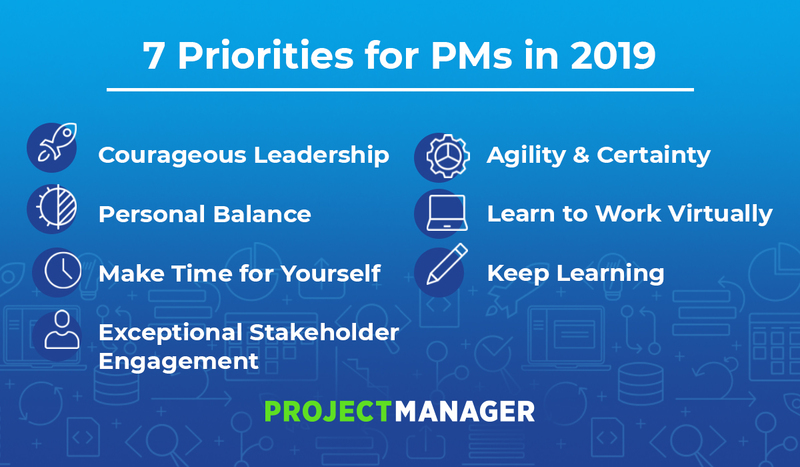 So, we must be aware of them, as we establish our seven priorities for project managers in 2019. Given the prevalence of disruption, my first priority has to be exemplary leadership. I don’t think you’ll find many countries today where there is a consensus that national leadership fits this description. And I certainly don’t think that the majority of leaders are prioritizing the needs of their stakeholders when managing projects, nor are they making the hard decisions that they need to. But as project leaders, we must stand out. We are building the future for our sponsors. And this means that, to get it right, we must put ourselves on the line and act with absolute integrity. We can do nothing else if we want our teams to behave well and deliver for us. A complex and demanding environment, coupled with a determination to do what is right, despite the cost, will make for high levels of stress. So, my second priority is to look after yourself. Relationships: These indicate both our mental health and the source of protection for it. Invest time and effort in maintaining the relationships that matter to you. A work-life balance is essential given today’s “always on” culture. Linked to priority 2 is the need to carve out time that is just for yourself. It seems unfashionable to talk about having a hobby these days, but maybe the term “passion project” will be more appealing. And, what I encounter ever more often are project managers with a “side gig” — a project on the side. Do what it takes to create balance in your life. This priority does not change from year to year. I fully expect it to be a priority in 2020—and also in 2121. As a project manager, make sure you are serving your client, your sponsor and your organization, but the people who will truly judge your work are your stakeholders. This is to say that, if you place your stakeholders at the heart of every scrap of planning and delivery, you will be most likely to get things right. Make the commitment to engage them actively. Ask questions, listen, respect their views and open a dialogue. Keep your stakeholders fully informed, and work hard to balance the needs of each against those of the others. There are plenty of project management commentators to remind you of the rise of agile. And certainly, if you are not aware of its strengths, shortcomings and methodologies, you’ll need to make learning about it a priority for 2019 (see priority 7). There are also plenty of agile zealots who will tell you, variously, that traditional PM is dead… or that it ought to be! To them I say your priority is to chill and get some perspective. If you look at the history of project management, with thousands of years of successfully planned projects, “traditional” projects suggest that these methods are the baby, not the bathwater. The rise of small, compact, agile teams, who use scrum or scrum-like methodologies has had an important mirror. This is the rise of large, global teams who rarely or never meet in the real world. Large organizations have always had to organize globally. But more of us are working with virtual teams, in different offices, in different organizations, and in no office at all, but a converted bedroom in a private home. These are virtual teams, made of people who work together, but may never meet. Tools like Slack, Sharepoint, and ProjectManager.com oil the bearings of virtual collaboration. But, regardless of location, the values that drive good teamwork don’t change. And, as a project manager, you need to understand them and put them into practice. It astonishes me how thin the various resources are on this subject. There is much to learn, yet we are still learning, as a human culture, how to do something so alien from the way we evolved. Cross cultural interactions in person are hard, but it’s nothing compared to managing them over an ADSL fiber. This last priority is also an evergreen priority, like priority 4. It’s built into most professional qualifications, like those of the PMI and APM. As a professional, your skills need to grow, or they will wither. There is no middle ground. Related: Which Project Management Certification is Right for You? Whatever route you choose for professionalism, I think the PMI’s guideline of 35 education hours per three years must be an absolute minimum. That is, after all, just an hour a month. And you cannot even read a decent professional magazine in that time. It’s just three articles like this, per week. Another priority for project manager in 2019 is making sure they’re equipped with the best tools to take advantage of new trends. ProjectManager.com is a cloud-based project management software that gives users real-time dashboards and a collaborative online Gantt chart for better scheduling. Try it today, free with this 30-day trial.